Compact district heating valve, with wide application range. 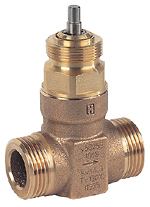 For domestic hot water and district heating; hot water or cold water (max. 50% glycol), water quality VDI2035. Valve type 2-way press. bal. Additional description Approved according DIN EN 14597 in combination with ML7435E/ML6435B.